When the original Phantom Lady returns to Gotham City for a mini-reunion with Lady Blackhawk, a forgotten, decades-old evil wakes from its slumber and plans twisted revenge on our heroines! 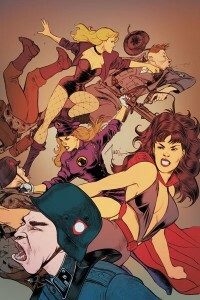 Can Canary, Huntress, and Oracle unravel the mystery and save their comrades? This special issue by the guest team of Marc Andreyko (MANHUNTER) and Billy Tucci (Shi) also guest-stars Manhunter!